Abstract : Multifunctional nanoparticles such as magneto-plasmonic nanohybrids are rising theranostic agents. However, little is yet known of their fate within the cellular environment. In order to reach an understanding of their biotransformations, reliable metrics for tracking and quantification of such materials properties during their intracellular journey are needed. 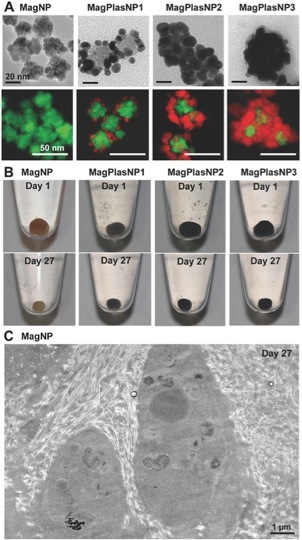 In this study, their long-term (one month) intracellular fate is followed within stem-cell spheroids used as tissue replicas. A set of magnetic (magnetization) and thermal (magnetic hyperthermia, photothermia) metrics is implemented to provide reliable insightsinto the intracellular status. It shows that biodegradation is modulated by the morphology and thickness of the gold shell. First a massive dissolution of the iron oxide core (nanoflower-like) is observed, starting with dissociation of the multigrain structure. Second, it is demonstrated that an uninterrupted gold shell can preserve the magnetic core and properties (particularly magnetic hyperthermia). In addition to the magnetic and thermal metrics, intracellular high-resolution chemical nanocartography evidences the gradual degradation of the magnetic cores. It also shows different transformation scenarios, from the release of small gold seeds when the magnetic core is dissolved (interesting for long-term elimination) to the protection of the magnetic core (interesting for long-term therapeutic applicability).